I think everyone knows by now that I have a strong love of cleansers. Balms, oils, gels are in regular rotation but I've recently been adding in cleansing milks to my routine and enjoy the way they make my skin feel. I know many times cleansing milks are targeted more for those with drier skin, but I find they help to give me a nice cleanse without stripping the skin. I've found 4 that I like from various price points, and could easily work well with any skincare routine. 1. Chantecaille Flower Infused Cleansing Milk - Soft does not even begin to describe this formula. Whatever word means softer than soft, that would describe this cleanser. It has a creamy consistency that envelopes the skin, immediately calms and soothes it, but does not leave it heavy with residue. In fact, when I first tested it out on the back of my hand, I was able to just rub it into the skin without using any water to rinse it off. THAT is how soft and lovely this cleanser is to use. If my skin is feeling particularly dry or irritated, I find that just rubbing this on the skin and removing with a cloth leaves my face feeling balanced and smooth. 2. 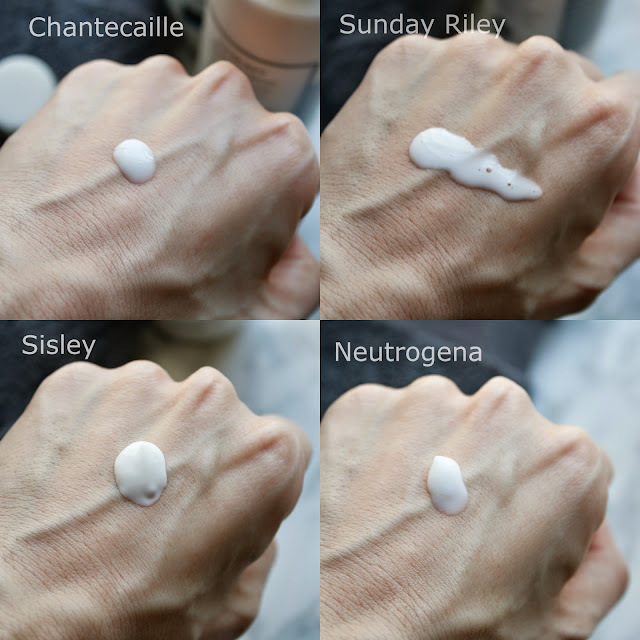 Sunday Riley Charisma Creme Cleanser - As an oily skinned gal, the Sunday Riley Ceramic Slip Cleanser has been a favorite for a long time. But I was curious to give this creme cleanser a try to see if I would like it as much. It's a much thinner milk texture that works best for me when applied on dry skin as a second cleanse or morning cleanse. The formula has fruit acids which give the skin a mild exfoliation and make it look incredibly bright and radiant. I like to spend time massaging it into my skin when dry and then again when I add water to really allow for the ingredients to work their magic. Little did I know that the Ceramic Slip Cleanser wouldn't be my only favorite Sunday Riley cleanser. Seriously, this skincare line can do no wrong in my eyes. 3. Sisley Cleansing Milk with White Lily - If a cleansing cream and milk had a baby, it would be this Cleansing Milk from Sisley. It's not too thick and not too thin, it falls perfectly in the middle. I can use this to both remove my makeup or as a second cleanse. While I have been gravitating towards oils and balms recently as my first cleanse, I was amazed at how great my skin felt and looked after using this milk to remove makeup. On nights when I am feeling particularly lazy, this is actually the cleanser I reach for first because it removes my makeup and moisturizes it all at once. I actually did a test with using just this cleanser and no other skincare to determine how my skin would feel. Surprisingly, it felt soft, hydrated and smooth as if I had done a few steps. Yup, I'm impressed. 4. Neutrogena Extra Gentle Cleanser - It's been a while since I've used a drugstore cleanser, but I picked this up on a whim one day and found it to be a great addition to my routine. It's a very no-muss, no-fuss cleanser that has little to no scent, gives a refreshing and soothing feeling to the skin and is perfect for those times when my skin is acting up/having a reaction/irritated. It is the epitome of gentle and I think it's absolutely necessary to have something like this in one's arsenal at all times. This cleanser paired with my all time favorite holy grail moisturizer for emergency skin situations makes for a first aid kit type of skincare routine that I can always count on.